Download Logicly 1.7.4 today for the latest bug fixes, including official support for Windows 10 and Mac OS X 10.11 “El Capitan”. 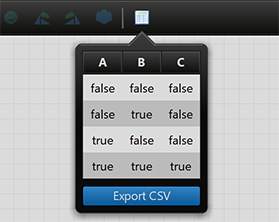 Today, I’m happy to announce the official release of Logicly version 1.7. Thank you so much to the beta testers who helped track down bugs to make this a stable release. This release finally lets you open multiple files at once and edit them side by side. 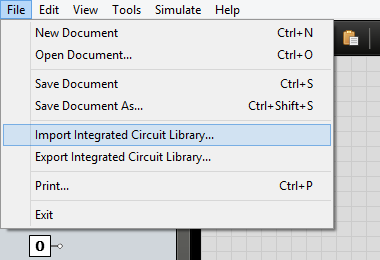 You can even copy and paste between them, including custom integrated circuits. If you ever encountered an issue where you couldn’t delete a gate in a Logicly document, that bug has finally been fixed. And finally, the Mac version has been updated to support Retina displays for crisp and clean graphics. Thank you again to the helpful beta testers who reported bugs and provided awesome feedback. Now, please point your browser to the Logicly download page or go to the Help menu in Logicly and choose Check for Updates. If you’ve been playing with the free trial, and you like what you see, maybe now is the perfect time to buy Logicly. The new Tri-State component will act like a normal Buffer when its enable input is High (true), passing on its other input value unchanged. However, if it’s enable input is Low (false), the Tri-State component will output the new hi-Z signal. 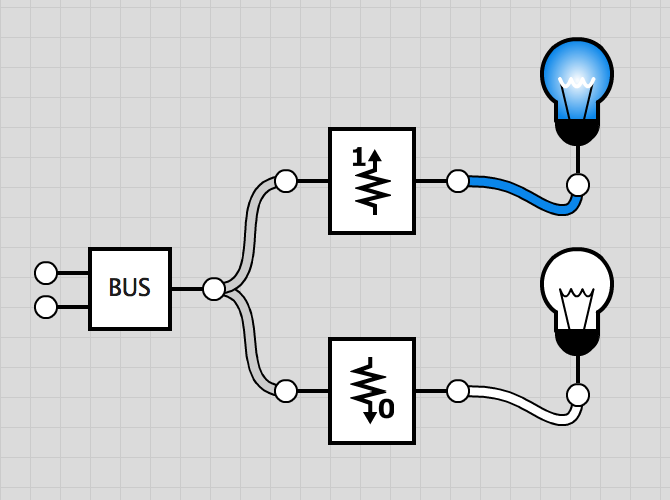 This is a special signal that is meant to be used with a Bus, the other new component added to Logicly in version 1.6.0. The new Bus component allows you to combine multiple connections together into one. 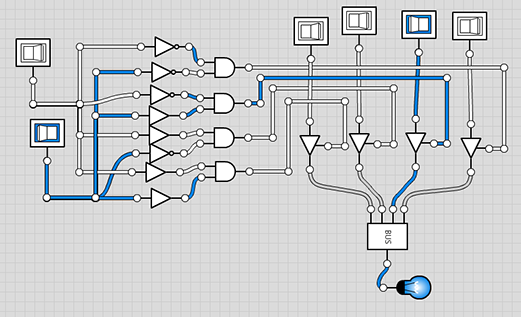 When a Bus component receives a hi-Z signal in one of its inputs, it will ignore that input completely. The ideal situation is that all but one input to a Bus will recieve a hi-Z signal and the final input will have a High (true) or Low (false) value that will be passed on to the output. When using a Bus, you will need to be careful about sending it conflicting signals. If it receives both High (true) and Low (false) signals at the same time, the Bus will output an Unknown signal to signify an error. Watch out for propagation delays! 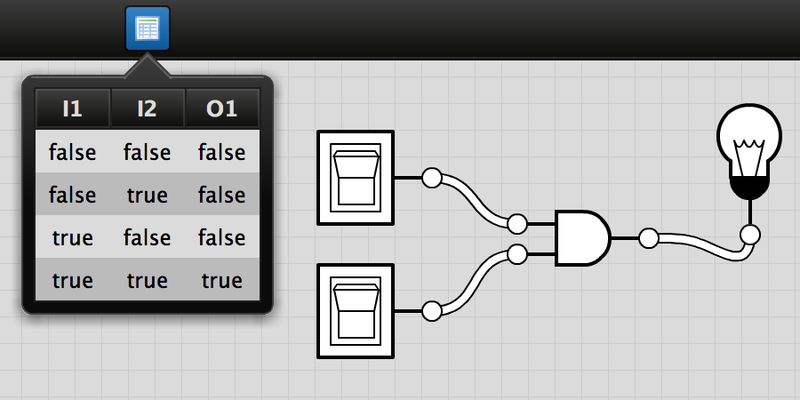 Adding in Buffers can be useful for ensuring that all inputs to a Bus will updated at the same time. When other components, such as logic gates, receive a hi-Z signal to any of their inputs, they will also treat it as an error and output an Unknown signal. As always, this release includes a various bug fixes and other minor enhancements too. Enjoy, and update to Logicly 1.6.0 today!